Have you had your daily dose of dirt? Researchers in Australia have been experimenting with dirt, or at least the bacteria found in good soil, as a treatment for asthma and other diseases. These scientists believe that some children are not exposed to important bacteria and this lack of exposure is understood to create problems in their immune systems. A sterile childhood, instead of creating wellbeing, seems to be creating new health concerns. Staying indoors and away from all of those mud-pies, dog slobber, scraped knees, and bugs may turn out to be more harmful than not. Creating wild experiences for kids, whether it is eating carrots straight from the garden, hunting for earth worms, or swimming in Lake Chestermere, may be valuable for their physical health. Other research is demonstrating that wild outdoor experiences may also help our children grow emotionally, socially, and spiritually. Our children cannot engage the world from behind a protective pane of glass, they need to touch, see, hear, smell, and even taste a bit of nature if they are to grow into healthy adults. The same is true for us. Our lives were not meant to be lived cloistered and away from nature and others. The poet Mary Oliver asks, “Tell me, what is it you plan to do with your one wild and precious life?” It is a question that is meant to take us inward and outward. Do we value the life we have? I believe that God deeply values you. You are beautiful and precious to God, beloved and provided for. I also believe that our lives were meant to be lived out, not sealed away. We were meant to be taken out for a run, to play, work, and rest. God has given each of us so much capacity to get hands-on with our lives, to engage others, get dirty, and to grow as we were meant to. Dirt is good for us, and life provides a lot of it. In our family or neighbourhood we are given plenty of opportunities to ‘get dirty.’ We can get involved, volunteer, take a neighbour for coffee, help another through a tough time, or ask to borrow a garden tool. We can engage the neighbourhood around us. Sometimes this seems scary, messy, or risky – and it is for those who do not know the value it all. When we enter into relationship with others, we do not know the outcome. But we were not made to watch the world from afar, we were made to step into the wild bits of life and enjoy the journey. It is because, not in spite, of our precious life that we choose to enter into relationship with others. Our neighbourhood truly can become a place of life when we see it for what it truly is. We may now be able to order dirt pills, but in the end we may need to jump out and into the world before us. May your neighbourhood be a place where you come alive, where you experience relationships, and where you ‘get-dirty’ in all the very good ways we were created to do so. Your life is precious, so go and see what it can do. 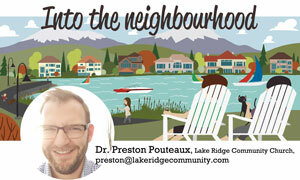 Preston is a pastor at Lake Ridge Community Church in Chestermere and experiments mostly in the intersection of faith and neighbourhood. Into the Neighbourhood explores how we all contribute to creating a healthy and vibrant community. Preston is also a beekeeper; a reminder that small things make a big difference.